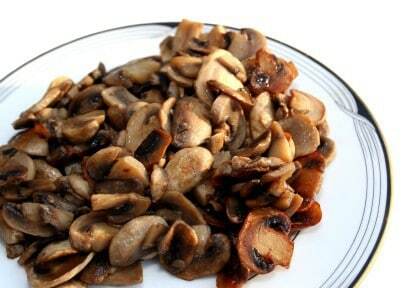 Home » Appetizers » Bugaboo Creek Sautéed Mushrooms – garlic and mushrooms go together so well. These are the tastiest mushrooms sautéed in olive oil and garlic. Sautéed mushrooms are perfect to have on a steak, as a side dish, or even on a baked potato. Mushroom and garlic just go together, enjoy these easy to prepare mushrooms any night of the week. Clean and trim mushrooms, leaving only the caps. Heat extra virgin olive oil in large pan, add garlic and sauté for 30 seconds. Add mushrooms and sauté over medium/high heat until brown. Reduce heat to low for 4-5 minutes. Stir frequently, adding lemon juice, salt, pepper and parsley. Sauté ingredients for one more minute. Thanks to siscorley for sharing this recipe. I tried this the other night with our steaks it was such a good compliment! We will be making these every time we make steaks. Bugaboo Creek Sauteed Mushrooms sound great. I will find out today.